The Herodian dynasty is named after Herod the Great, who was recognized as king of the Jews by the Romans in 40 BCE. The Herodian dynasty is named after Herod the Great, who was recognized as king of the Jews by the Romans in 40 and continued to rule until 5 or 4 BCE. In these years, he created a powerful vassal kingdom, with Caesarea and Jerusalem as splendid capitals. He was succeeded by his sons Archelaus (Judaea), Antipas (Galilee), and Philip (the northern territories), but in 6 CE, the Romans added Archelaus’ realms. The kingdom was reunited by Agrippa I, who ruled from 41 to 44. After his death, Rome reannexed Judaea, leaving the area around the Sea of Galilee to Agrippa II. Herod was born 73 BCE as the son of a man from Idumea named Antipater and a woman named Cyprus, the daughter of an Arab sheik. Antipater was an adherent of Hyrcanus, one of two princes who struggling to become king of Judaea. In this conflict, the Roman general Pompey intervened in Hyrcanus’ favor. Having favored the winning side in the conflict, Antipater’s star rose, especially since he cooperated with the Romans as much as possible. In the civil war between Pompey and Julius Caesar, Hyrcanus and Antipater sided with the latter, for which especially the courtier was rewarded: in 47, he was appointed epitropos (“regent”) and received the Roman citizenship. It was obvious that Antipater was the real power behind Hyrcanus’ throne. He managed to secure the appointment of his son Herod to the important task of governor of Galilee. He launched a small crusade against bandits, which made him very popular with the populace and impopular with the Sanhedrin. On March 15, 44 BCE, Caesar was murdered. The new leaders in Rome were Caesar’s nephew Octavian and Caesar’s powerful second-in-command Mark Antony. They announced that they would punish Caesar’s murderers, Brutus and Cassius, who fled to the East. Cassius ordered all provinces and principalities to pay money for their struggle against Octavian and Mark Antony, and Judaea had to pay some 15,000 kg of silver. Antipater and his sons had to take harsh measures to get the money, and in the ensuing troubles, Antipater was killed. With Roman help, Herod killed his father’s murderer. In 43, Hyrcanus’ nephew Antigonus tried to obtain the throne. Herod defeated him, and secured the continuity of the line of Hyrcanus by marrying his daughter Mariamme. Of course, the young man was not blind to the fact that this marriage greatly enhanced his own claim to the throne. This appointment caused a lot of resentment among the Jews. After all, Herod was not a Jew. He was the son of a man from Idumea; and although Antipater had been a pious man who had worshipped the Jewish God sincerely, the Jews had always looked down upon the Idumeans as racially impure. Worse, Herod had an Arab mother, and it was commonly held that one could only be a Jew when one was born from a Jewish mother. When war broke out between the Romans and the Parthians (in Iran and Mesopotamia), the Jewish populace joined the latter. In 40, Hyrcanus was taken prisoner and brought to the Parthian capital Babylon; Antigonus became king in his place; Phasael committed suicide. Herod managed to escape and went to Rome, where he persuaded Octavian and the Senate to order Mark Antony to restore him. And so it happened. After Mark Antony and his lieutenants had driven away the Parthians, Herod was brought back to Jerusalem by two legions, VI Ferrata (whose men had already fought in Gaul and the civil wars) and another legion, perhaps III Gallica (37 BCE). Antigonus was defeated and after he had besieged and captured Jerusalem, and had defeated the last opposition, Herod could start his reign as sole ruler of Judaea. He assumed the title of basileus, the highest possible title. Herod’s monarchy was based on foreign weapons; the start of his reign had been marked by bloodshed. His first aim was to establish his rule on a more solid base. Almost immediately, he sent envoys to the Parthian king to get Hyrcanus back from Babylon. The Parthian king was happy to let the old man go, because he was becoming dangerously popular among the Jews living in Babylonia. Although Hyrcanus was unfit to become high priest again, Herod kept his father-in-law in high esteem. The support of the old monarch gave an appearance of legality to his own rule. The new king started an extensive building program: Jews could take pride in the new walls of Jerusalem and the citadel which guarded its Temple. (This fortress was called Antonia, in order to please Herod’s patron Mark Antony.) 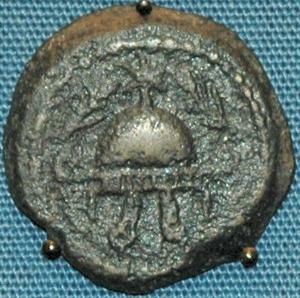 Coins were minted in his own name and showed an incense burner on a tripod, intended to signify Herod’s care for the orthodox Jewish cult practices. These coins had a Greek legend – HÈRÔDOU BASILEÔS – which indicates that Herod considered his standing abroad. And the new king continued to please the Romans, to make sure that they would continue their support. He sent lavish presents to their representative in the East, Mark Antony, and to his mistress, the Egyptian queen Cleopatra. These gifts almost were Herod’s undoing. The relations between on the one hand Mark Antony and Cleopatra in the East and on the other hand Octavian and the Senate in the West became strained, and civil war broke out in 31. It did not last very long: in August, the western leader defeated the eastern leader, who fled to Alexandria. For the first time in his life, Herod had aligned himself with a loser. He managed to solve this problem, however. First, he had Hyrcanus executed, making sure that no one else could claim his throne. Then, he sailed to the island of Rhodes, where he met Octavian. In a brilliant speech, Herod boasted of his loyalty to Mark Antony, and promised the same to the new master of the Roman Empire. Octavian was impressed by the man’s audacity, confirmed Herod’s monarchy, and even added the coast of Judaea and Samaria to his realm. Actually, Octavian did not have much choice: his opponents were still alive, and if he were to pursue them to Egypt, Herod could be a useful ally. As it turned out, Mark Antony and Cleopatra preferred death to surrender, and Octavian became the only ruler in the Roman world. 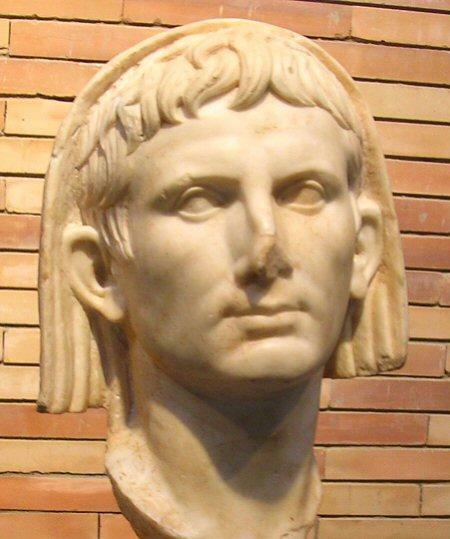 Under the name Augustus, he became the first emperor. He rewarded his ally with new possessions: a.o. Jericho and Gaza, which had been independent. Herod’s position was still insecure. He continued his building policy to win the hearts of his subjects. (A severe earthquake in 31 BCE had destroyed many houses, killing thousands of people.) In Jerusalem, the king built a new market, an amphitheater, a theater, a new building where the Sanhedrin could convene, a new royal palace, and last but not least, in 20 BCE he started to rebuild the Temple. And there were other cities where he ordered new buildings to be placed: Jericho and Samaria are examples. 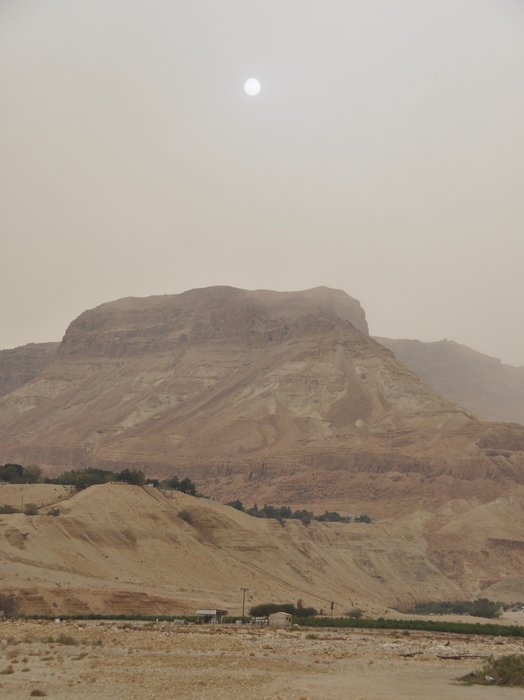 New fortresses served the security of both the Jews and their king: Herodion, Machaerus, and Masada are among them. 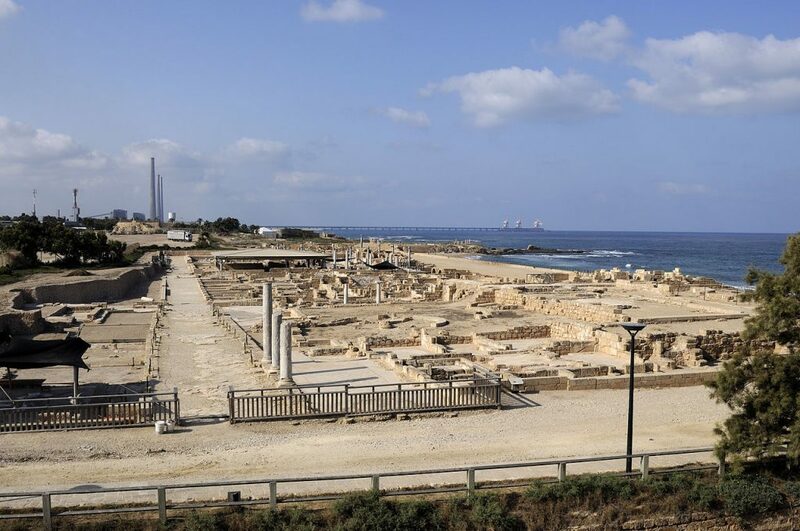 But Herod’s crowning achievement was a splendid new port, called Caesarea in honor of the emperor (the harbor was called Sebastos, the Greek translation of “Augustus”). This magnificent and opulent city, which was dedicated in 9 BCE, was built to rival Alexandria in the land trade to Arabia, from where spices, perfume and incense were imported. It was not an oriental town like Jerusalem; it was laid out on a Greek grid plan, with a market, an aqueduct, government offices, baths, villas, a circus, and pagan temples. (The most important of these was the temple where the emperor was worshipped; it commanded the port.) The port was a masterpiece of engineering: its piers were made from hydraulic concrete (which hardens underwater) and protected by unique wave-breaking structures. Although Herod was a dependent client-king, he had a foreign policy of his own. He had already defeated the Arabs from Petra in 31, and repeated this in 9 BCE. The Romans did not like this independent behavior, but on the whole, they seem to have been very content with their king of Judaea. After all, he sent auxiliaries when they decided to send an army to the mysterious incense country (modern Yemen; 25 BCE). In 23, Iturea and the Golan heights were added to Herod’s realms, and in 20 several other districts. With building projects, the expansion of his territories, the establishment of a sound bureaucracy, and the development of economic resources, he did much for his country, at least on a material level. The standing of his country -foreign and at home- was certainly enhanced. However, many of his projects won him the bitter hatred of the orthodox Jews, who disliked Herod’s Greek taste – a taste he showed not only in his building projects, but also in several transgressions of the Mosaic Law. The orthodox were not to only ones who came to hate the new king. The Sadducees hated him because he had terminated the rule of the old royal house to which many of them were related; their own influence in the Sanhedrin was curtailed. The Pharisees despised any ruler who despised the Law. And probably all his subjects resented his excessive taxation. According to Flavius Josephus, there were two taxes in kind at annual rates equivalent to 10.7% and 8.6%, which is extremely high in any preindustrial society.note It comes as no surprise that Herod sometimes had to revert to violence, employing mercenaries and a secret police to enforce order. On moments like that, it was clear to anyone that Herod was not a Jewish but a Roman king. He had become the ruler of the Jews with Roman help and he boasted to be philokaisar(“the emperor’s friend”), entertaining Agrippa, Augustus’ right-hand man. On top of the gate of the new Temple, a golden eagle was erected, a symbol of Roman power in the heart of the holy city resented by all pious believers. Worse, Augustus ordered and paid the priests of the Temple to sacrifice twice a day on behalf of himself, the Roman senate and people. The Jewish populace started to believe rumors that their pagan ruler had violated Jewish tombs, stealing golden objects from the tomb of David and Solomon. Doris, from an unknown family in Jerusalem: married c.47, sent away 37; recalled 14, sent away 7/6. She was the mother of Antipater, who was executed in 4. The Hasmonaean princess Mariamme I: married 37, executed in 29/28. According to Flavius Josephus, Herod was passionately devoted to this woman, but she hated him just as passionately. Five children: Alexander, Aristobulus, a nameless son, Salampsio and Cyprus. An unknown niece: married 37. No children. An unknown cousin: married c.34/33. No children. The daughter of a Jerusalem priest named Simon, Mariamme II: married 29/28, divorced 7/6. They had a son named Herod. A Samarian woman named Malthace: married 28, died 5/4. Their children were Antipas, Archelaus and Olympias. A Jerusalem woman named Cleopatra: married 28. They had two sons named, Herod and Philip. They had a son named Phasael. They had a daughter named Roxane. They had a daughter named Salome. Herod’s reign ended in terror. When the king fell ill, two popular teachers, Judas and Matthias, incited their pupils to remove the golden eagle from the entrance of the Temple: after all, according to the Ten Commandments, it was a sin to make idols. The teachers and the pupils were burned alive. Some Jewish scholars had discovered that seventy-six generations had passed since the Creation, and there was a well-known prophecy that the Messiah was to deliver Israel from its foreign rulers in the seventy-seventh generation. The story about the slaughter of infants of Bethlehem in the second chapter of the Gospel of Matthew is not known from other sources, but it would have been totally in character for the later Herod to commit such an act. A horrible disease (probably a cancer-like affection called Fournier’s gangrene) made acute the problem of Herod’s succession, and the result was factional strife in his family. Shortly before his death, Herod decided against his sons Aristobulus and Antipater, who were executed in 7 and 4 BCE, causing the emperor Augustus to joke that it was preferable to be Herod’s pig (hus) than his son (huios) – a very insulting remark to any Jew. However, the emperor confirmed Herod’s last will. After his death in 4 BCE, the kingdom was divided among his sons. Herod Antipas was to rule Galilee and the east bank of the Jordan as a tetrarch; Philip was to be tetrarch of the Golan heights in the north-east; and Archelaus became the ethnarch (“national leader”) of Samaria and Judaea. 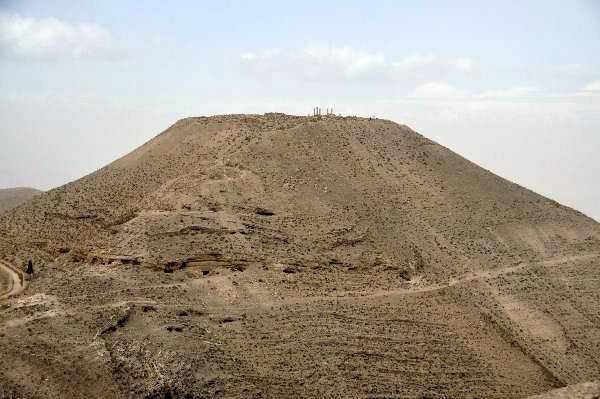 Herod was buried in one of the fortresses he had built, Herodion. Few will have wept. Herod Antipas – a nickname derived from Antipatros – was the son of the Jewish king Herod the Great and his wife Malthace; he was full brother of Archelaus and a half brother of Philip. With his brothers Archelaus and Philip, he was educated in Rome, a kind of honorable detention to guarantee his father’s loyalty. In his father’s testament, Herod Antipas was appointed tetrarch of Galilee and Peraea (the east bank of the Jordan). The Roman emperor Augustus confirmed this decision and Antipas’ reign could begin (4 BCE). In 17 CE, he founded a new capital, which he called Tiberias, to honor the Roman emperor, Tiberius. Unfortunately, it was discovered that he was building this city on top of an old Jewish graveyard. This caused great unrest among his subjects. For a long time, no pious Jew would enter Tiberias, which was populated by Greeks and Romans. However, Herod Antipas was a Jewish leader, or liked to pose as a Jewish leader. For example, he is known to have celebrated Passover and Sukkoth in Jerusalem. Unfortunately, his subjects were not convinced by their leader’s piety. Jesus of Nazareth compared him to a fox, an animal that was ritually unclean. He was first married to Phasaelis, a daughter of Aretas IV, an Arab leader. Later, he divorced her in order to marry Herodias. She had been the wife of Herod Antipas’ half-brother (who was also called Herod). Marriage to the ex-wife of one’s brother was not uncommon, but Herodias was also the daughter of another half-brother, Aristobulus. Marriage to one’s niece was also permitted, but marriage to a woman who was both one’s sister-in-law and one’s niece was unusual. According to the Gospel of Mark, John the Baptist criticized the king and was consequently killed. Flavius Josephus writes that Herod Antipas’ subjects were convinced that the war with Aretas that broke out in 36, and the Arab successes during this war, were a divine punishment (text). The author of the Gospel, however, offers a different explanation: Antipas’ daughter Salome had been dancing in public, much to the delight of her father, who asked her to ask a present, and was shocked to learn that she demanded the head of the Baptist. The readers of this story must have understood that Antipas a terribly wicked man, because no loving father would ask his daughter to dance in front of strangers. In 37, Herodias’ brother Agrippa became king of the realms of Philip. She thought that the royal title ought to be given to her husband and made a plan to make Herod Antipas king. The emperor did not agree and exiled the tetrarch of Galilee and Peraea to Lyon in Gaul. Herod Archelaus was born in 23 BCE as the son of king Herod and his wife Malthace; he was full brother of Herod Antipas and a half brother of Philip. With these brothers, he was sent as a hostage to Rome, where he received his education. In his father’s testament, Herod Archelaus was appointed king, but the Roman emperor Augustus wrote him that he had to contend himself with the title of ethnarch (“national leader” ) of Samaria, Judaea and Idumea. In his absence, there were fresh riots. The leaders were a robber named Judas, a royal slave called Simon, a shepherd named Athronges and his brothers. Perhaps, they were all messianic claimants; in case of Athronges, this is even probable. Archelaus’ troops were unable to cope with them, and the Roman governor of Syria, Publius Quinctilius Varus, had to intervene. It was a major operation, which probably involved all Syrian legions (III Gallica, VI Ferrata, X Fretensis). Two thousand people were crucified, but not all leaders were caught. Ultimately, Archelaus came to terms with one of Athronges’ brothers, something that will not have made a good impression. Matthew implies that Jesus’ parents Joseph and Mary were afraid to go to the territories ruled by Archelaus, and therefore settled in Galilee (Matthew 2.22). Several of his coins show a bunch of grapes. This was the most common picture on a Jewish coins, reminding the user of the coin of the fabulous fertility of the country (the image is derived from Numbers13.23). A crested morion was shown on the reverse; its significance is unclear to us, although it must be pointed out that this “Boeotian helmet” was very un-Roman. Other coins showed the bow of a ship and a laurel wreath. The Jewish king Herod the Great had many sons and one of them was Aristobulus. However, the prince and the king were not on speaking terms; after two trials before the Roman emperor Augustus, Herod had his son executed in 7 BCE. Aristobulus’ son Agrippa, named after Augustus’ friend Marcus Vipsanius Agrippa, was spared. The boy was only three years old – he was born in 11 – and was sent to Rome, where he received a Roman education with the princes of the ruling dynasty, the Julio-Claudians. Among his companions were the later emperors Caligula and Claudius. King Herod died in 4 BCE and was succeeded by three other sons: Herod Antipas was to rule Galilee and the east bank of the Jordan as a tetrarch; Philip was to be tetrarch of the Golan heights in the north-east; and Archelaus became the ethnarch (‘national leader’) of Samaria and Judaea. For the greater part of his live, Agrippa lived in Rome. Here he met his wife Cyprus, a distant relative, and here his five children were born: Drusus (who died young), Agrippa, Berenice, Mariamme and Drusilla. He spent all his money, went bankrupt and had to flee from his creditors at the beginning of the thirties. In 33, we find Agrippa in Idumea, the southern part of Judaea. Later, he was official in Tiberias, the capital of Galilee founded by his uncle Herod Antipas. However, Agrippa fell out of favor, went to Antioch, where he quarreled with the Roman governor, spent some time in Alexandria, where he encountered troubles too. However, a rich man named Tiberius Julius Alexander (the brother of the philosopher Philo) gave money to his wife. In his despair, he decided to return to Rome, where his friend Caligula was probably able to solve his financial problems. He had to borrow money and was unable to pay for the passage of his family. In Rome, he discovered that Caligula could only help him when he was emperor. Agrippa encouraged him to seize power, but the emperor Tiberius knew what was happening and had the Jewish prince imprisoned in the autumn of 36. He left the house of detention as a king. In 34, Agrippa’s uncle Philip had died without sons. 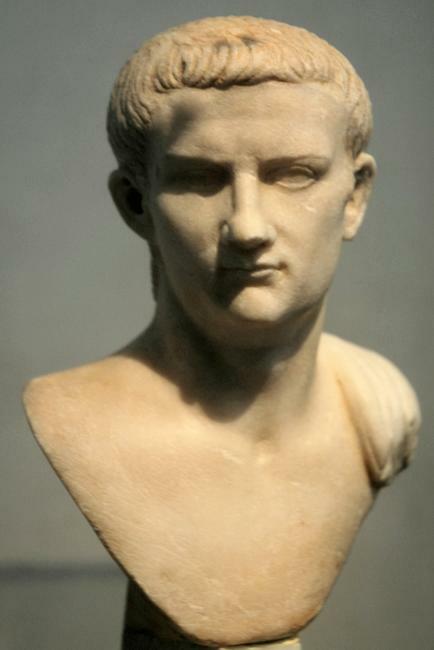 The emperor Tiberius had ordered his realms to be added to the province of Syria, but on March 16, 37, he died. Caligula became emperor and almost immediately restored the principality; as its king, he appointed his loyal supporter Herod Agrippa. He was the first to be called “king” since his grandfather, Herod the Great, who had died almost forty years earlier. Agrippa stayed in Rome. The relation between the Jewish king and the Roman emperor was excellent, which is remarkable, because many considered Caligula a madman, and he could be very cruel indeed. In the early summer of 38, Caligula sent Herod Agrippa on a diplomatic mission to Alexandria. He discovered that governor Flaccus was incompetent and unable to stop the anti-Semitic agitation in the city. It is probable that this was also the moment on which he married his daughter Berenice to Marcus, the son of the Tiberius Julius Alexander who had given him financial help. In July or August 38, Agrippa arrived in his kingdom. One of his first acts was directed against bandits who had taken over a part of the realm. Not much is known about this period of Agrippa’s reign. In 39, Agrippa’s uncle Herod Antipas tried to “steal” Agrippa’s royal title. Caligula intervened: Agrippa’s uncle was exiled to Gaul and his realm, Galilee and Peraea, was given to Agrippa. At that moment, Agrippa was staying with Caligula, who was campaigning against the Germanic tribes along the Rhine. The ancient sources describe this war as a silly exercise of a mad emperor, but there is sufficient archaeological evidence of fighting in the neighborhood of Wiesbaden. There is also proof that in the winter of 39/40, the emperor and his entourage were present at a large military exercise near the mouth of the Rhine. A new campaign was launched against the Chauci on the shores of the North Sea. Agrippa must have been present, even though the details are unclear. The Jewish prince must have felt uncomfortable under the low skies of the Netherlands. In January 41, Caligula (who was by now showing signs of complete insanity) and Herod Agrippa were in Rome. On the twenty-fourth, the emperor was murdered, and the Jewish king played a very important role during the accession of Claudius. The latter was grateful to Agrippa; Judaea and Samaria were added to Herod Agrippa’s realm. He was now king of all the territories that had once been ruled by Herod the Great. Jerusalem was again the capital of Palestine as a whole and received new city walls. Agrippa’s entry in the city of David and Herod was a triumph. Like his uncles and grandfather, Agrippa was both a hellenistic and a Jewish ruler. His building program was essentially Greek; for example, he spent lavishly in Berytus, a “pagan” city. On the other hand, he did a lot for the temple in Jerusalem, repaired several buildings, and finished an aqueduct that had been ordered by Herod the Great and continued by Pontius Pilate. Some Jews will have appreciated how he took measures against a sect from Galilee, the Christians. After these successes, a strange incident took place in 44. 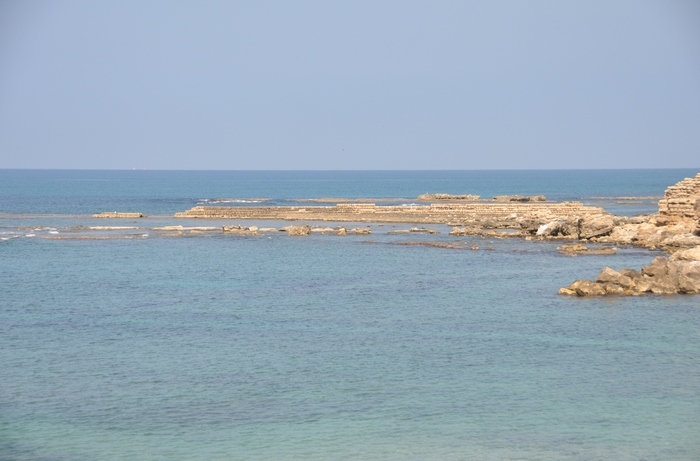 King Herod went down from Judea to Caesarea and stayed there. […] And upon a set day Herod, arrayed in royal apparel, sat upon his throne and delivered an oration unto them. And the people gave a shout, saying, “It is the voice of a god, and not of a man!” And immediately the angel of the Lord smote him, because he gave not God the glory; and he was eaten by worms and gave up the ghost. After he said this, his pain was become violent. Accordingly he was carried into the palace, and the rumor went abroad that he would certainly die in a little time. But the multitude presently sat in sackcloth, with their wives and children, after the law of their country, and besought God for the king’s recovery. All places were also full of mourning and lamentation. Now the king rested in a high chamber, and as he saw them below lying prostrate on the ground, he could not himself forbear weeping. And when he had been quite worn out by the pain in his belly for five days, he departed this life, being in the fifty-fourth year of his age, and in the seventh year of his reign. What to make of this story? It is obvious that Herod Agrippa was regarded by some as a divine being, maybe because he had reunited all Jewish territories and had liberated them from Roman rule. In other words, he had done the things that some people expected from a Messiah. After some troubles the last king of the Jews was succeeded in some of his territories by his son Julius Marcus Agrippa. 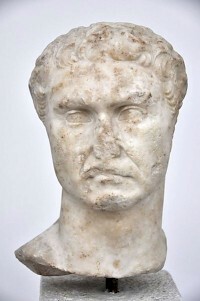 Agrippa’s daughter Drusilla was married to Marcus Antonius Felix, the procurator of Judaea (52-58); Agrippa’s daughter Berenice was the mistress of the future emperor Titus. Julius Marcus Agrippa was born in 27 or 28 in Rome was the son of the Jewish prince Herod Agrippa and his wife Cyprus. When his father had to flee from his creditors, the boy visited Palestine for the first time – he must have been five years old. When his father returned to Rome in 36, Julius Marcus and his mother had to stay behind. The elder Agrippa’s career had not been very successful: he had lost his fortune, had gone bankrupt, had fled, had found a job in Galilee (where his uncle Herod Antipas ruled) and had lost this job. When he returned to Rome, he was imprisoned. However, he was released by the new emperor Caligula and made king of the territories that had once been ruled by his uncle Philip. Soon, new provinces were added, and in 41, father Agrippa had reunited the complete kingdom of his grandfather, king Herod the Great. The younger Agrippa was sent back to Rome to finish his studies. He was fourteen years old; and he was sixteen or seventeen when his father died unexpectedly in the summer of 44. Julius Marcus Agrippa was too young to be king and his father’s territories became a Roman province. The Roman government was obliged to offer the disinherited boy a kingdom of his own. In 48, his uncle Herod of Chalcis died, a brother of his father. (Chalcis was an independent town, halfway between Beirut and Damascus.) It is probable that Julius Marcus Agrippa also was responsible for the temple in Jerusalem: he had the right to appoint the high priest. He may have stayed in Rome until 53, when the emperor Claudius added the territories that had once been ruled by his father’s uncle Philip to his realms: the Golan heights and several adjacent countries. To control him, Claudius appointed a powerful procurator in Samaria and Judaea, Marcus Antonius Felix, the brother of Claudius’ adviser Pallas. One year later, Claudius’ successor Nero added the city of Tiberias (the capital of Galilee) and parts of Peraea (the east bank of the river Jordan). The young king took his residence in Jerusalem and Caesarea. In the first city, he enlarged the royal palace and renovated the temple; in the second, he met the Christian apostle Paul in 58. 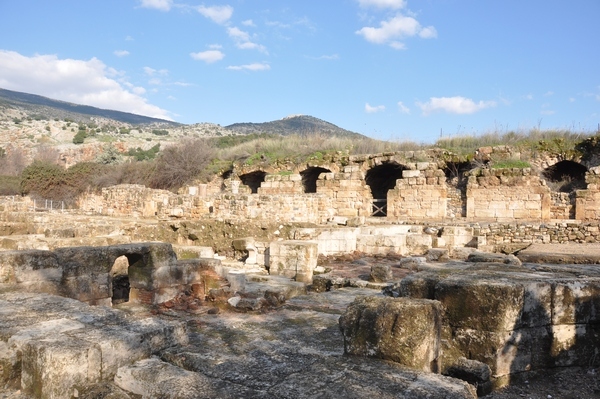 These two towns were also the residences of the Roman governor of Judaea, and they must have cooperated closely. In his own kingdom, he refounded the town Panias and named it after the emperor Nero: Neronias. In 63, the temple was completed, which caused some unrest among the artisans now unemployed. It was not the only disturbance. Roman taxation had impoverished the working class of Judaea and there was a food shortage. In 65 or 66, the situation escalated, when Marcus Julius Agrippa was in Alexandria; people were killed in a tax riot and the Roman governor Gessius Florus crucified some bystanders. Agrippa’s sister Berenice witnessed the atrocities, but was unable to prevent them. Agrippa returned, delivered a speech to dissuaded the Jerusalem populace from revolt, but failed. War had become inevitable and Agrippa sided with the Romans. Their legions were commanded by Vespasian, a successful commander, who started to reconquer Galilee and Judaea. In June 68, the Roman attack was slowed down, because the emperor Nero was killed and a new emperor was chosen, Galba. Vespasian sent his son Titus to Rome to congratulate the new ruler; in his company were king Agrippa and queen Berenice, who had become Titus’ lover. When they learned that Galba had been killed in January 69, Titus and Berenice went home, but Agrippa continued to Italy, where he witnessed the civil war: he must have met the new emperors Otho and Vitellius, and he must have been in Rome when heard that Vespasian had decided to rebel. Agrippa hastened home in the first weeks of 70, at the right moment to be present when Titus, who had succeeded his father as commander, attacked Jerusalem. He must have witnessed the destruction of the temple that he had renovated himself. In 75, Agrippa was back in Rome, where he must have been present when Vespasian inaugurated the Forum of Peace (a public garden in the center of Rome), must have met his wife Berenice, and received new territories in Syria: Arca, east of modern Tripoli. There was not much left that would have made him a Jewish king: the temple was destroyed, his realm was situated in Syria and only a few of his inhabitants were Jews. He must have continued to rule for some twenty-five years. An inscribed lead weight found in the neighborhood of Tiberias mentions his forty-third regnal year (i.e., 97/98) and the Byzantine scholar Photius informs us that he has read that Agrippa died in the third year of the Roman emperor Trajan (100). There are indications that he lost some territories after 93, and what remained was incorporated in the Roman empire in 100. It is unclear whether he left behind a family. Our sources do not mention any children. The most important ancient source for the rule of king Herod was written by Flavius Josephus: his Jewish Antiquities and his Jewish War. Originally published by Livius, 02.23.2019, republished with permission for educational, non-commercial purposes. This entry was posted in Uncategorized and tagged Ancient, Herod, Herodian, History, Israel, Jew, Judaism. Bookmark the permalink.